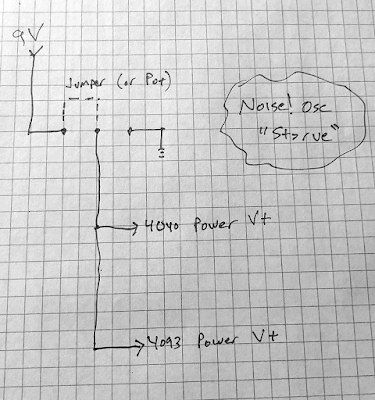 AUDIODIWHY BLOG: Reverselandfill.org Noise! Part I: Making Noise! Reverselandfill.org Noise! Part I: Making Noise! Welcome back! Last year I did a PCB swap with Martijn Verhallen from Reverselandfill.org. Fun!! Martijn specializes in industrial electronic music and video synthesis and always has some very cool boards at his site. Last year I built a module based on a reverselandfill design that Martijn calls "Aconitum Noise Mixer". Never being able to leave anything alone, I modified it using some C1406HA's, a oddball and somewhat obscure stereo panning SIP IC, which I put into play as a quad attenuator. I am happy with how this DIY module came out--you can read part I of my Aconitum build here; part II is here. This time I get started on the second PCB Martijn sent me. After sitting in my PCB box for many months I figured it was finally time to build his Noise! 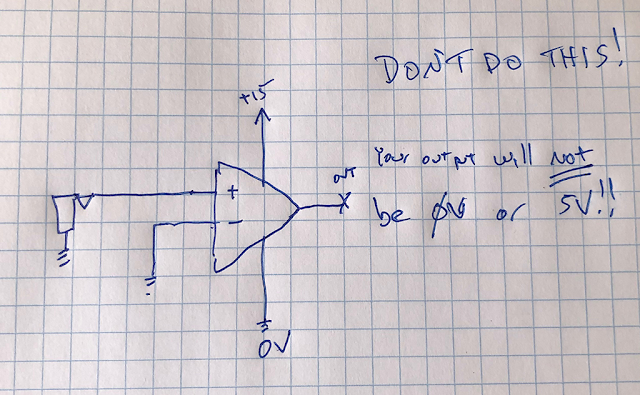 Oscillator design. Here we go! Rev B of the board--Rev C is current--what I get for letting the board sit in my to build box to long! 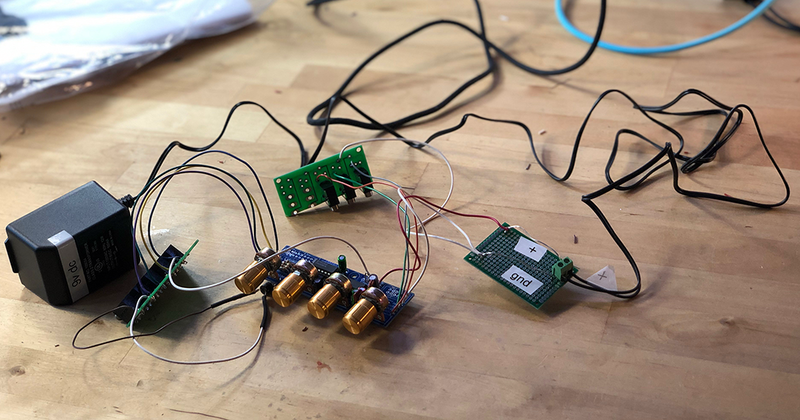 It's quite a different approach to noise creation compared to the "lifted leg transistor" upon which Martijn based his Aconitum design. Noise! is more of a random tone generator then part of the analog white/pink noise hegemony. 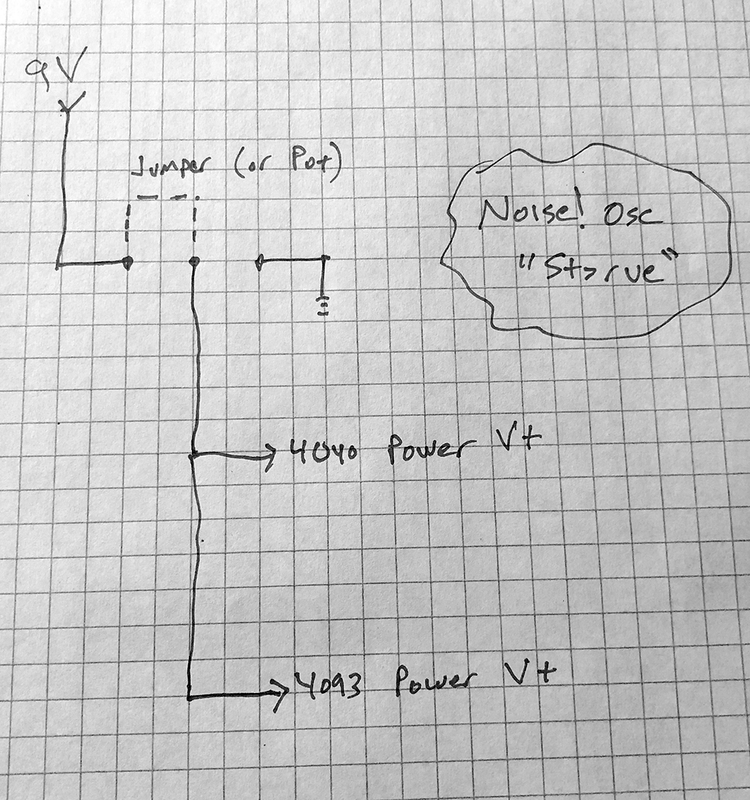 The noise osc board at its core relies on two popular CMOS ICs known to Lunetta enthusiasts everywhere: the 4093 CMOS Schmitt trigger and CMOS 4040 divider. As usual, Martijn has conjured up a creative and musical board! An interesting feature of the board I've not seen before is what Martijn calls "starve". The idea is to crank down the DC voltage feeding the CMOS ICs. That will greatly change the sound of the device (and it does, I've tried it). 1001 uses? Interesting (and easy) thing to try on any CMOS audio creation perhaps. For 9V use a jumper; for starve action, use a pot. Interesting results! For this post I will get the basic PCB working; down the road I will automate the board's patch bay for added voltage controlled craziness. About the build: The Noise! Oscillator is well documented and uses easy to find parts, so stuffing the board was a breeze. I populated the board (it is sized for Eurorack; I use FracRak so some shoehorning will be in order) and created some 3.5mm audio I/O PCBs for testing. I've been using Switchcraft RAP2AV's more and more lately; they are reliable, solidly built, and perfect for slapping together something to mess with fast. For power (for now) I am using a 9V wall wart from my junk box. If everything works I will convert a 15V rail from my power supply to 9V. More on that in an upcoming post. Good news: I put in the chips and caps and whatnot and the Noise! Osc board worked first time. But of course I'm never happy with that (too easy right? ), so I got out my rework station to try different cap values and different pots to see what would happen. Sadly I sucked up a couple of traces when messing with the pots which took me a couple of hours to diagnose and fix. Damn! As I am writing this post I am still messing with the RC values for the oscillators.....I also tried adding vactrols instead of the pots (which didn't seem to work that well) and ended up settling on a single vactrol in parallel with the leftmost 100K pot. Ah! Now we are ready to test. Each 4093 based oscillator has CV control; with my vactrol addition that's 5-count 'em! 5 different CV's for some very odd noises. OK, the basic build works and small pot and CV adjustments go a long way with this board. I'm happy so far--I've never heard anything else like the noise! osc and it will be fun to create some audio samples when it's 100% done. As usual, hats are off to Martijn. Coming up: I have designed and sent a gerber off for fab to automate the patch bay. I have no idea if that will work or how it will sound once it's in play. I'll also need to fab a 3u frak panel for this, something I've not done in many years. So: lots more work still to do for this one. After about 8 hours work on this build today, it's time to stop breathing the fumes. Until next time--Aloha!